Eleven-year-old Ellie has never liked change. She misses fifth grade. She misses her old best friend. She even misses her dearly departed goldfish. Then one day a strange boy shows up. He’s bossy. He’s cranky. And weirdly enough . . . he looks a lot like Ellie’s grandfather, a scien Galileo. Newton. Salk. Oppenheimer. To ask other readers questions about The Fourteenth Goldfish, please sign up. I'm wondering if I should read it? Can someone please give a more in-depth explanation about what it's about? Ellie is eleven years old, lives with her eccentric actress of a mom while her dad is a traveling actor. Ellie has just started the sixth grade, started middle school and is feeling overwhelmed and lost. One day her mother gets a call to pick up her grandfather from the police, and brings home a thirteen year old boy Melvin, who is actually her grandfather. 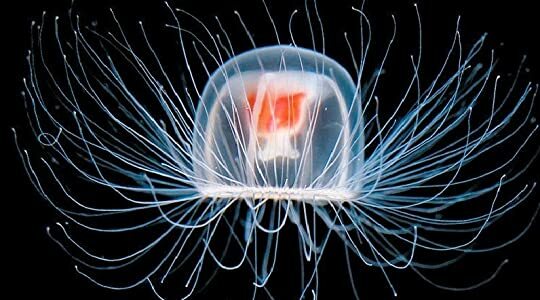 Through a special jellyfish, Melvin developed a serum to reverse the aging process, and he used it on himself. Mentally a seventy 3 stars! Ellie is eleven years old, lives with her eccentric actress of a mom while her dad is a traveling actor. Ellie has just started the sixth grade, started middle school and is feeling overwhelmed and lost. One day her mother gets a call to pick up her grandfather from the police, and brings home a thirteen year old boy Melvin, who is actually her grandfather. Through a special jellyfish, Melvin developed a serum to reverse the aging process, and he used it on himself. Mentally a seventy year old man in the body of a thirteen year old, Melvin is having trouble accessing his lab to gain all of the data that made him young. He enlists Ellie for help and the two form a strong bond. A very interesting concept, what would an old person be like if they became young again? And how would they be perceived by other young adults? This book was very humorous in tone, the grandfather in a thirteen year old body acting in curmudgeonly ways, ordering adults around and criticizing fellow youth for not acting as mature. Written for a younger tween audience, it deals with some scientific concepts that could very well be above their heads. Lots of scientific names, theories and such if a young reader did not like science it is possible they wouldn’t like this book. What saves the book from this is the authors mix of humor and her great original characters. The interactions between Melvin, Ellie and Ellie’s mother were hilarious because despite the age reversal, the family dynamics did not change. It was also great to see a young female protagonist interested in science, as there is a public stigma that boys like science and girls do not. Want to raise kids who embrace curiosity, thrill in discovery, appreciate science, and care about ethics? Hand them this book. 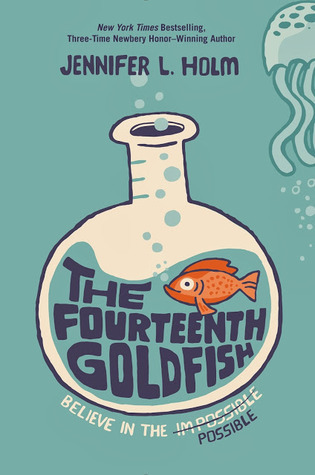 Warm, wise, and wonderfully accessible, The Fourteenth Goldfish is, on the surface, the entertaining story of an 11 year-old whose grandfather has found a way to reverse aging and is now forced to attend middle school alongside her. But dig a little deeper and you'll find this novel is a rich invitation for readers to explore and ponder big questions about the world and Want to raise kids who embrace curiosity, thrill in discovery, appreciate science, and care about ethics? Hand them this book. 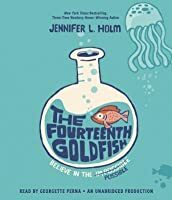 Warm, wise, and wonderfully accessible, The Fourteenth Goldfish is, on the surface, the entertaining story of an 11 year-old whose grandfather has found a way to reverse aging and is now forced to attend middle school alongside her. But dig a little deeper and you'll find this novel is a rich invitation for readers to explore and ponder big questions about the world and our place in it. Kids should come away with increased appreciation for and/or interest in science, genetics, discovery, experimentation, scientists (e.g. Salk, Curie, Oppenheimer), the history of medicine, and much, much more. For a book with a similar tone, try When You Reach Me by Rebecca Stead. For another book in which a cantankerous old man teaches his granddaughter to love science, try The Evolution of Calpurnia Tate by Jacqueline Kelly. For another book about the role of aging and importance of the life cycle, try Tuck Everlasting by Natalie Babbitt. For a nonfiction book about scientists conducting experiments on themselves, try Guinea Pig Scientists: Bold Self-Experimenters in Science and Medicine by Mel Boring and Leslie Dendy. Meh. I didn't find this as endlessly enchanting and heartwarming as other reviewers did. To me, it read like the usual 21st-century slapped-together-in-a-hurry crap that typically gets packaged for middle grade readers as a skinny chapter book. Wow, the author says girls can be scientists, give 'er a medal. About as deep and developed as your average Scooby-Doo episode. keywords: I'll give you cranky; and we all know what happened to Mme Curie; of course he dresses like an old guy; maybe they ra Meh. I didn't find this as endlessly enchanting and heartwarming as other reviewers did. This book was awarded by NetGalley - I LOVED it!!! I wish I had read this book while I was in middle school! I think it had EVERYTHING I would have wanted! The way the Information was so gently handed to the reader, would have prompted me to find other books to further research the scientists, they were so well explained. The family issues, and interactions were believable. Growing out of one relationship and into another as we all do, as the one between Ellie and her best friend and having divor This book was awarded by NetGalley - I LOVED it!!! The family issues, and interactions were believable. Growing out of one relationship and into another as we all do, as the one between Ellie and her best friend and having divorced parents is a part of life. So much was brought full circle!! I loved the beginning about the 13 goldfish, the part where Ellie realized about her 14th goldfish was beautiful! The phrase "To the possible!" is one of hope and faith, a great message to promote. The endings/beginnings theme throughout the book was very well done. The relationship with Melvin and Ellie and her mother again is a cycle theme, and the smaller issues that keep revolving give this story strength. I think Melvin convinced me to re-read "Catcher in the Rye". Grandfathers aren’t supposed to look like 13-year-olds, have acne and wear their hair in ponytail holders. But Ellie Cruz’s does—such is the premise of “The Fourteenth Goldfish” by Jennifer L. Holm, known too many because of her “Baby Mouse” and “Squish” series, and Newbery Honor awards. Ellie’s granddad, Melvin Sagarsky, a scientist, has discovered the fountain of youth via a jellyfish compound called T. melvinus. Now the 76-year-old has a senior brain in a pubescent body. Madcap mayhem ensues Grandfathers aren’t supposed to look like 13-year-olds, have acne and wear their hair in ponytail holders. But Ellie Cruz’s does—such is the premise of “The Fourteenth Goldfish” by Jennifer L. Holm, known too many because of her “Baby Mouse” and “Squish” series, and Newbery Honor awards. Ellie’s granddad, Melvin Sagarsky, a scientist, has discovered the fountain of youth via a jellyfish compound called T. melvinus. Now the 76-year-old has a senior brain in a pubescent body. Madcap mayhem ensues as grumpy grandpap goes to school with Ellie, is viewed as dateable material by her buddy Brianna and constantly badgers Ellie’s theater-mom about everything from turning the heat up to staying out too late with Ben, the man she’s dating. Mostly humor-filled, “The Fourteenth Goldfish” has serious overtones when it references famous scientists from the past. And when it focuses on the splashy, negative repercussions of unleashing a discovery that would allow people to live forever. This must-read-book is solid gold. Thank you to Netgalley and Random House for providing me with a copy of this book in exchange for an honest review. "Endings are sad....but beginnings are exciting." This is one of those books I was invited to read via Netgalley. When I received the invitation, I did not realize this was a middle grade book, so that revelation was rather surprising. This was a cute book with lots of great messages for middle grade readers, but it definitely requires a great suspension of disbelief (probably much e Thank you to Netgalley and Random House for providing me with a copy of this book in exchange for an honest review. This is one of those books I was invited to read via Netgalley. When I received the invitation, I did not realize this was a middle grade book, so that revelation was rather surprising. This was a cute book with lots of great messages for middle grade readers, but it definitely requires a great suspension of disbelief (probably much easier for the intended audience to do). Ellie is eleven and about to enter middle school. At the start of the book, her mother is called away to pick up her grandfather, who has been arrested for trespassing. This is where it enters a bit of a sci-fi realm. Ellie's grandfather, Melvin, is a scientist and he finally had a breakthrough with his latest research project - reverse aging. Unfortunately, the project worked a little too well, as he now appears to be a 13-year-old boy. Now he has to live with Ellie and her mother and attend school with her, despite that he possesses the mind of a 70-something year-old man. As an adult reader, the premise gave me pause if only because Ellie's mother did not seem to have any reaction whatsoever to her father's dramatic change. No one questioned it at all. The few people he told simply accepted it. Then the little subplot about his lab and the company he worked for, there were some holes there - why did no one wonder where he had gone? How could no one know of this research, etc? But those are questions an adult might ask, and this is not a book for adults. Poking holes in this fantastical story misses the point. In actuality, these ideas go along with one of the book's themes - believe in the possible. When imparting wisdom upon a middle grade reader, it's important to encourage imagination and "the [im]possible", so as to fuel new ideas and dreams. Ellie's parents are both very theatrical and interested in drama and theater, but Ellie has never had much interest in that subject. They tell her to find her passion, but, like many parents, suggest that she should be passionate about their passion - theater. I thought it was a great message to send to kids that they find their own passions in life, regardless of what their parents love. Enter Melvin, who doesn't have much use for theater, but is a big fan of science. Through their interactions, Ellie learns about a whole world she's never been exposed to, and she finds her passion in it. It was very clever for Holm to use Melvin as a way not only to unlock Ellie's passion for science, but also as a way for Ellie to realize that there is so much that her elders can offer - friendship, knowledge, wisdom - that she might otherwise ignore (because let's face it, western kids tend to write off their elders as, well, old). Making Melvin appear her age really gave her a way to relate to him so she could hear his messages. In other words, elders are interesting and should be revered, not ignored. After all, they aren't so different than the rest of us, even if they appear different on the outside. Also of interest was the idea that the old can still learn from the young. As Ellie becomes more interested in science and starts reading about famous scientists and their inventions on her own, she develops some critical thinking skills and starts to contemplate the wisdom of some scientific advancements. That is, just because we can do something, does that mean we should? The story also had some themes involving change - the change from elementary school, where you know everyone, to middle school, where you are introduced to loads of new students you've never met; and the ways in which lifelong friendships change as the young discover new interests and grow apart. The quote above, that endings are sad, but beginnings are exciting, encapsulates the main theme within the book. For a middle school aged child, this is a very important lesson to learn because that age is so full of endings and beginnings. The Nitty Gritty: Ellie's world is about to get sucker punched in the gut. First, her best friends runs off for greener pastures with the volleyball team, her father is off on a tour with his play company and her mother is a hipster looking for some fashion sense. If that isn't enough her grandfather is now a moody teenager. Like most people Ellie doesn't like change, but her grandfather and more importantly her dearly departed goldfish, Goldie just might teach the middle schooler that change is The Nitty Gritty: Ellie's world is about to get sucker punched in the gut. First, her best friends runs off for greener pastures with the volleyball team, her father is off on a tour with his play company and her mother is a hipster looking for some fashion sense. If that isn't enough her grandfather is now a moody teenager. Like most people Ellie doesn't like change, but her grandfather and more importantly her dearly departed goldfish, Goldie just might teach the middle schooler that change is a necessary part of life. The Opening Line: Eleven year old Ellie never liked change. The Good: This was a cute and light read. Something that I would recommend to any budding scientist. Especially girls. Anything to show girls that they can be more than what TV and Twilight is telling them is ok in my book. We are really starting to question gender roles and girls are breaking out of that Victorian mold we've been regulated to since...well the Victorian era, and now authors are starting to get on the bandwagon and I am all for it. Ellie as a main character was a bit simple minded to the point that I wanted to slap her with a better education, but then she would pop up and cook breakfast and I would like her again. Anyone that cooks is A-ok in my book. Ellie was a different kettle of fish from her other literary counterparts in that she isn't boy crazy, worrying about her looks, bemoaning her lack of social status and all that other nonsense. I like that. Women are multifaceted creatures and I like that Holm is giving us that. Especially in a younger character. Its so important to show girls that all that they are is ok. You can be the shy artsy girl, or the kooky theater girl, the math geek, the volleyball girl, the cheerleader, or the test tube chaser. Its ok to be all of those things and she still be a girl and still be awesome. Or you can be the girl that doesn't really know what she wants to do yet. Ellie is that girl. She knows she has a fountain of passion bubbling away inside her, she just hasn't found her outlet and she wasn't rushed to find it. The "grown-ups" in her life allowed her to find it. There wasn't any pressure to be this or be that. Sure her parents wanted to expose her to the things they loved, but she was free to like it or not. I think that is a great lesson for kids and parents. The Bad: Ellie and her mother just accept that this teenage boy is her grandfather/father without much ado about nothing. There's no discussion, no screaming, tears, denial...nothing. He just walks in the door and everyone accepts it. I call BS on that. If my 90 year old grandfather suddenly turned up in the body of a 13 year old I would have a few questions and a hard time swallowing that. And I write fractured fairy tales for a living. The chapters ended abruptly and they started off in weird places. There was a bit of a disconnect there. This book was a tad hard on the "soft science" or the creative arts. Though it did have a redeeming moment in the kitchen between Ellie and her grandfather as they looked through her late grandmother's recipe book. I thought that was a very Southern thing. Don't get me wrong I know people in the North have recipe books, but for a girl in the South getting her mother's or grandmother's recipe book is a right of passage. When I got my grandmother's cast iron skillet I cried. That scene for me tugged at all my heart strings. This book would work better in 3rd person. Everything is on the surface with the characters and their development. Sure Ellie does go through a change as all growing kids do, but I didn't feel it was genuine. I would have loved to have really gotten into the head of her grandfather. This is one character that had one foot in the grave and now he gets to do it all over again. All we got from his was black hole hunger and sullen teen. We got that in Twilight. I just wanted a little more. The first person POV hindered that. This is a children's book. I don't agree with it, but some people say allowances have to be made for that. In any case, if you decide to read it, keep that in mind. Synopsis: Ellie is an 11 year-old girl with artistic parents who is currently suffering a break-up from her best friend, and doesn't like the change. One day, her grandfather, Melvin, appears at her house as a 13 year-old boy, announcing he's discovered the cure for aging. As Ellie and her mother adapt to their new situation, significant and deep changes are wrought in all their lives. Overall enjoyment: Meh. I tried, I really did. And I suppose I would have liked it less if I hadn't tried. Plot: The idea is really interesting, but it's poorly executed. There's no development, no climax, and everything is a bit too obvious. The chapters are very disconnected from each other. World/setting: Again, it's like she did the bare minimum. It doesn't play a big part on the story, though. Writing style: A bit sloppy. The book feels like a first draft. It feels unfinished, and, up to a point, that's what bothers me the most. I kept thinking "this could be such a good book with a bit of rewriting and editing!" The first chapter is really good, sweet and interesting, with a bit of humor. The rest is just a bunch of disjointed phrases thrown together. And it really bothered me how obvious things were. I don't mean the suspense of the story, but the characters' feelings and motivations; she kept spelling them out all the time. It may be a children's book, but kids aren't stupid. They're perfectly capable of understanding those things, you don't have to explain that to them. Representation: She didn't specify anybody's ethnicity. There was a kid named Raj, with a brother named Andalos, but she doesn't even describe them. And everyone is cis, straight and able-bodied. Political correctness: This book was made to get kids interested in science, so that's a plus. It's even more specifically addressed at girls, with a girl as a main character, so that's a double plus. I just wish it had been better written. Something I enjoyed immensely, though, was the fact that she didn't try to force romance onto the kids. Ellie meets a boy, and they become friends, but not a couple. I can't tell you how satisfying that was. And how uncomfortable I was while reading, sure that, despite the fact that this is an 11 year-old girl, they would end up kissing, or something. This one was not entirely bad, just disappointing. Especially after it started off so strong. This almost felt too short. It started and ended quite abruptly and I was left wanting more. I see there’s a sequel so look forward to checking that out. I loved the science aspect of it and the family relationships and enjoyed the story, though. Read it on the recommendation of my 9-year-old. This review has been hidden because it contains spoilers. To view it, click here. I read The Fourteenth Goldfish for a second time today and still really liked it. The only thing I wished was different about the book, was if not everything ended happily so suddenly--her mom gets married to Ben, and Ellie suddenly has Momo as her new best friend. Of course I like happy endings, but I wish there was a bit more struggle for it. Sách dễ thương, đọc 1 lèo trong 1 buổi tối. Nhưng không thích bằng mấy cuốn trước của Jennifer L. Holm. 1. This is like Rebecca Stead lite! And I mean that as a compliment! Stead's books explore themes in interesting and sophisticated ways. This explored a theme (the impacts of science on nature) on a bunch of levels in a way that is (probably) easier to grasp for most young readers. I'm very excited to talk to kids about this one. 2. Man, I love this idea of a teenage grandparent. So funny. There was something about it that was familiar to me, but I can't put my finger on where I've seen it before. It begs to be a movie with a great young actor playing Melvin with his scrunchies and polyester pants. Now, I will admit that so much of the Melvin story stretches logic past its breaking point, but I don't care. The story was realistic where it needed to be, and not so realistic in other places. I thought it all flowed beautifully in service of the story. 3. I wish I had read this earlier so I could have booktalked it at my school visits last spring. Our Summer Learning theme is science and this book pushes science in a really fun way. Ellie feels left out of her mom's theater world and her friend's volleyball world, but finds she belongs in the world of scientists. I liked this a lot more than I was expecting to. I had checked this title out because I just wanted something short for a couple of walks/runs. I was reminded of "Flowers for Algernon" pretty early on in the story, but this book wasn't treading that same ground. Instead, this book covered a lot of different territories: growing old, losing friends and making new friends and the pain there, learning to live with one's parents' expectations, learning to accept one's child's differences and interest I liked this a lot more than I was expecting to. I had checked this title out because I just wanted something short for a couple of walks/runs. I was reminded of "Flowers for Algernon" pretty early on in the story, but this book wasn't treading that same ground. Instead, this book covered a lot of different territories: growing old, losing friends and making new friends and the pain there, learning to live with one's parents' expectations, learning to accept one's child's differences and interests, opening oneself to possibilities, tolerance, the importance of curiosity and asking questions....and the part I liked best, science is okay and interesting. Cuốn sách thiếu nhi với cốt truyện đơn giản, về một nhà khoa học và cô cháu gái cùng nhau nghiên cứu và phát triển một thứ thần dược giúp người ta trẻ mãi không già. Nhưng cuối cùng họ nhận ra, lớn lên rồi già đi là một quy luật tất yếu của cuộc đời, không thể can thiệp hay thay đổi, nếu như cố tình sẽ gây ra những hậu quả khôn lường. Người ông của cô bé khi trở lại là một đứa trẻ tuổi 13 do thứ thuốc mình nghiên cứu đã gây rất nhiều phiền phức cho gia đình cô bé cũng như ngôi trường ông theo họ Cuốn sách thiếu nhi với cốt truyện đơn giản, về một nhà khoa học và cô cháu gái cùng nhau nghiên cứu và phát triển một thứ thần dược giúp người ta trẻ mãi không già. Nhưng cuối cùng họ nhận ra, lớn lên rồi già đi là một quy luật tất yếu của cuộc đời, không thể can thiệp hay thay đổi, nếu như cố tình sẽ gây ra những hậu quả khôn lường. Người ông của cô bé khi trở lại là một đứa trẻ tuổi 13 do thứ thuốc mình nghiên cứu đã gây rất nhiều phiền phức cho gia đình cô bé cũng như ngôi trường ông theo học để che mắt người đời. Nhưng khi trở lại thành chú bé 13 tuổi, ông và cô cháu gái có điều kiện gần gũi và hiểu nhau hơn. Ông đã truyền cho cô bé niềm đam mê khoa học, giúp cô nhận ra quy luật của cuộc sống là không ngừng phát triển đi lên, không thụt lùi cũng không đứng yên một chỗ. The Fourteenth Goldfish is a wonderful, funny tale on family, finding what you love in life and second chances. Readers both young and old, will undoubtedly appreciate Ellie's gradual discovery of her love of science, and her growing appreciation of family and friends in all ages and forms. I've been sitting on my review for The Fourteenth Goldfish for several months now, because I've been worried that I just can't do this book justice. It's a wonderfully inventive tale about a girl getting to know her grandfather, but it's also a book that brings up some pretty profound ideas, including examining Oppenheimer's work on the Manhattan Project, and also questioning the ethics of altering the natural order of things. In other words, it's one of those books that you want everyone to read, but you become concerned that by gushing about a book so much, you'll accidentally turn those others readers off. However, I'm determined to get people to pick this up, so I'll give it a go. Jennifer Holm introduces us to Ellie, an eleven-year-old who is going through an awkward period in her life. Her dad is out of town, her goldfish has died and her best friend has found another group of people to hang out with, effectively leaving Ellie on her own. But one day, her mother shows up with a teenaged boy claiming to be Ellie's grandfather Melvin. Melvin has reverted in age because of a scientific experiment involving a jellyfish, and now he needs Ellie to help him finish his work. What follows are hilariously madcap adventures, a new friendship, and a relationship which begins to develop between grandfather and granddaughter, that leads Ellie to realize just what she's good at, and where she might possibly begin to fit in. Holm's tale of a granddaughter and a grandfather who are able to meet while relatively close in age, is an enjoyable tale for so many reasons, particularly when it comes to the grandfather/granddaughter relationship. By having the newly-young Melvin appear in Ellie's life just as she's going through a host of difficult events, Holm does a great job of exploring the novelty of what it means to have an adult who does understand what a younger person is going through, something that all readers will likely relate with. Conversely, as Ellie works with her grandfather to continue his scientific work, Holm also does a wonderful job of showing the importance of having love - particularly familial love - and feeling like you have someone to work with, and inspire in your own life. Melvin has clearly been lonely since losing his wife, and it's obvious that Ellie's newfound interest in science not only encourages him, but also helps him find the courage to pursue goals that he's put off for many years. There are many strong reminders that it's sometimes the most unusual relationships that help you become even better versions of yourself, and it's heartwarming to see how Melvin and Ellie effect that change in one another. Outside of Ellie and Melvin's relationship, Holm also does a great job of asking some profound questions on science, and what it means to look beyond one's personal desires, for the betterment of the world. Both Ellie and Melvin pose questions and assertions on the advantages and ethics of certain research, which will undoubtedly encourage readers to think for themselves. While The Fourteenth Goldfish is a relatively short book at 208 pages, Holm has created such a rich world filled with fun characters and insightful looks at big concepts, I felt like I had completed a thoroughly satisfying journey by the time I got to the final page. Holm also concludes the book by leaving a hint that she may not be done with Ellie and Melvin just yet, and I sincerely hope that we'll be able to rejoin them at a later point. Of special note: Holm makes it a point to subtly highlight the value of being a non-conformist throughout the course of the book. Various characters have chosen to pursue their passions rather than what's appropriate and/or desired by others, a lesson that Ellie learns herself throughout the story. Educators and parents will likely appreciate Holm's reminder that it's not only important to pursue your dreams, but it's often that desire to work on your passions that can help lead to some of the biggest, most amazing discoveries out there. It's a very positive message, especially at an age when readers do feel peer pressure to conform. As another reviewer stated, The Fourteenth Goldfish isn't just any middle grade story about a girl and her goldfish. Jennifer Holm has written a funny, intelligent tale about that transitory period in a young person's life, as they begin to discover what they enjoy and who they're meant to be. Ellie begins the book a little unsure of what she wants out of life, but concludes her tale with a renewed interest in a field that is sure to take her to many different places. This is a book that will absolutely encourage young readers to dream big, while also hopefully inspiring them to look critically at the scientists, concepts and themes that are discussed in this book. As Jennifer Holm says in her author's note, "...believe in the possible." Ellie’s life gets a little strange when a thirteen year old boy comes home with her mom and claims to be her grandfather. All evidence points to him telling the truth, and Ellie is whisked into the world of science and “discovering the possible” as she tries to help her grandfather retrieve the specimen that made his life’s work - reversing aging - possible. But Ellie finds herself facing the question: is her grandfather’s discovery a good thing or a bad thing? Is it the kind of scientific discovery that will change the world for the better, or is it something that is better left alone? Ellie isn’t sure, and she has to get her grandfather to ask the question as well before he brings his discovery to light, ensuring the world will never be the same. This was a very fun book, and I really enjoyed reading it. I felt like sometimes, within the narration, Ellie didn’t feel as young as she’s supposed to be. But over all I really liked this and it’s super fun and yay for characters being excited about science! I liked the breezy, no questions asked, way this book handled the central idea: that Ellie's grandfather had indeed found a way to turn himself young again. I loved how it tackled family relationships and the dynamics of middle school. I can why it's getting such great buzz. At times, though,it was almost too breezy. There are some big issues here, and would have liked more! A wonderful story about life--growing up and growing old. this book has some great comedy and a nice section in the back that goes into a tiny bit more detail about some of the science-related stuff from the novel. And the concept is sort of interesting. When eleven-year-old Ellie's grandfather discovers a way to 'reverse' aging he becomes a thirteen-ish-year-old boy. And then...not much happens except he gets in a lot of fights with his daughter, who's now sort of his mother. they bicker a lot. It's funny. But, it's not funny enough to carry the whole this book has some great comedy and a nice section in the back that goes into a tiny bit more detail about some of the science-related stuff from the novel. And the concept is sort of interesting. When eleven-year-old Ellie's grandfather discovers a way to 'reverse' aging he becomes a thirteen-ish-year-old boy. And then...not much happens except he gets in a lot of fights with his daughter, who's now sort of his mother. they bicker a lot. It's funny. But, it's not funny enough to carry the whole book. And yet, for me, to a degree, it kind of does. that is not to say I disliked the rest of the book (parts in which grumpy old man/sullen young teenager is not bickering with his daughter/mother and saying inappropriate things to just about everyone). I liked most of the characters okay, but there wasn't too much depth to them. And in a book like this where we're expected to go along with a kind of nutty concept, it would have been nice if characters and situations were developed more. the beginning didn't really make sense (grandfather turns to adolescent boy, and no one really cares much) and the ending made just as little sense. spoilery rest of the paragraph. Skip to the next if you're worried about hearing some plot points from later in the book. In the beginning of the book, Melvin has to live with his daughter b/c he basically is now a kid. But by the end he gets to travel the world on his own as a thirteen-year-old? Also, Ellie's transformation from supporting her grandfather's work to questioning it happens really fast and the transformation isn't very, well, believable. On one hand, I appreciate that some middle grade and younger stories just set out concepts and gloss over a lot of story and character development and it works for a lot of readers. And I really love a lot of Holm's work and appreciate her humor and the way she portrays dynamics between characters. I like that Ellie's parents are divorced and friends and it's fine. And it's nice that Ellie makes a friend after losing her best friend to volleyball. And great that Jonah Salk and JR Oppenheimer and Louis Pasteur and Marie Curie and Hiroshima and forever jellyfishes get a little air time. And interesting that the family scientists are sort of against the artists but then the boundaries get blurred? I think? And everyone finds some value in arts and sciences? I was uncomfortable at times about the age situation and the sort of who is the adult and who is the kid scenarios and what does it mean for a grandpa to be surrounded by kids, well, his own age? I'm having similar discomfort reading a book in which a dog can talk and is anthropomorphized in ways that are at times sketchy. Ah well, with these kinds of concepts often there is a bit of sketchiness. But, all in all, I think it is a fine book for a middle grader and probably really fun for middle graders who like science.